Clare Wilkins, Chef at Cwrt Enfys Care Home in Ystradgynlais, has been named ‘Care Cook of the Year’ for 2014. 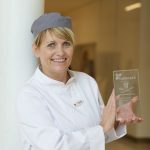 Clare, last year’s runner-up, was named the winner of our hotly contested annual competition following a cook-off between herself and three other chefs from across Hallmark Care Homes. 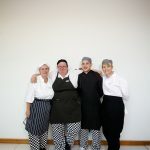 Denise Englefield (Alexandra Grange), Dawn Ingram (Tuxford Manor) and Daniel Cole (Shire Hall) also all made it through to the final, held at Unilver’s headquarters, after submitting an inspiring three course menu suitable for residents in their home. 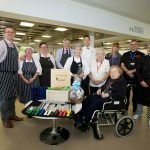 After familiarising themselves with the state-of-the-art kitchen, used by Unilever to test and develop new products, the finalists were given an identical ‘mystery box’ of ingredients and timeframe of 90 minutes to create their dishes.